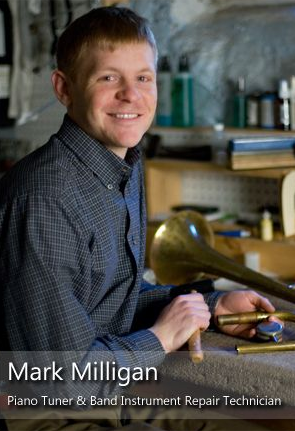 Mark Milligan consistently provides the highest quality of band repair and piano service to us. He operates on a high customer service level and can be depended upon for high quality workmanship while meeting repair deadlines at a competitive price. Mark Milligan, Piano Tuner and Band Instrument Repair Technician serves southern Wisconsin in the Edgerton and Janesville areas. Piano Tuning and Band Instruments Repair such as Oboe, Clarinet, Trumpet, Trombone, are available.